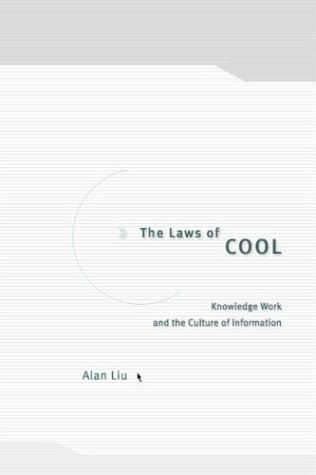 The Laws of Cool is a study of the relation of the contemporary humanities and arts to information culture, and of information culture itself to the now dominant business paradigm of "knowledge work." What crucial perspective on knowledge do the humanities and arts still contribute when the primary mission of knowledge is business? Reciprocally, how do "knowledge work," "lifelong learning," "learning organizations," and so on offer critical insight into the contemporary humanities? And finally, what is the mediating role of information technology as both the servant of the knowledge economy and the medium of the new humanism and aesthetics of technological "cool" (as it is so often called on the Web)? Part I of the book is titled "The New Enlightenment" (chapters on "'Unnice Work': Knowledge Work and the Academy," and "The Idea of Knowledge Work"). Together with the Introduction ("Literature and Creative Destruction"), this part establishes the frame of the problem by surveying postindustrial business theory alongside cultural-critical and poststructuralist understandings of the humanities. The comparison demonstrates both a surprising degree of overlap between recent views of business and the humanities and a striking difference: where New Economy business relies on a posthistorical thesis of innovation (what economist Joseph Schumpeter called "creative destruction"), humanities disciplines stress the primacy of historical awareness (even if in revisionary forms). Part II, which is titled "Ice Ages" (chapters on "Automating," "Informating," and "Networking"), offers a historical explanation of twentieth-century U.S. "knowledge work," the rise of information technology, and the correlative rise of the subculture, counterculture, mass culture, and finally techno-culture of "cool." Techno-cool is simultaneously enthralled by the technical rituals and routines of information-age production (itself descended from automation-age production)–and willfully unproductive, un-routine, even rebellious. Contemporary high-tech cool is thus a response to the dominating "corporate culture" of social adjustment that began in Fredrick Winslow Taylor's notion of managed "friendliness" and continues in information-age "user-friendliness" (as instanced in software usability and human factors research). An important corollary of this argument is that it is not consumer culture but instead "production culture" (the culture of the workplace) that is now crucial in understanding postindustrialism. Part III on "The Laws of Cool" (chapters on "What's Cool? ", "The Ethos of Information," "Information Is Style," "The Feeling of Information," and "Cyber-Politics and Bad Attitude") focuses on the present moment of technological and informational cool. This part studies the formal, technical, social, and political features of cool in the information age in order to understand both its potential and its constraints as a new popular humanism. High-tech cool is a mode of using "information to resist information" that creates not so much a subculture or counterculture as an "intraculture" of cool within the corporate ethos. Part IV is titled "Humanities and Arts in the Age of Knowledge Work" (chapters on "The Tribe of Cool," "Historicizing Cool: Humanities in the Information Age," "Destructive Creativity: The Arts in the Information Age," and "Speaking of History: Toward an Alliance of New Humanities and New Arts"). This concluding part reflects critically on the role of the humanities and arts in helping to shape the culture of cool. A collaboration of the humanities and arts assisted by information technology is now necessary to educate the generations of cool by providing access to historical knowledges that complement, offset, or contest the "creative destruction" of knowledge work. This argument harvests the practical experience of the author in creating The Voice of the Shuttle, Transcriptions, and other large-scale educational information-technology projects over the past decade. It also provides close readings of artistic and literary works that demonstrate what a "future literary" or "future aesthetics" might look like in conjunction with new technologies. The ultimate message of The Laws of Cool is that "cool" may be the most authentic response of contemporary culture to postindustrial knowledge work because it holds open a reserve of counter- or anti-knowledge (an "ethos of the unknown"), but nevertheless in its current form cool is often also know-nothing, narrow, shallow, self-centered, cruel, and coopted. Laws of Cool posits that the task of the humanities and arts at the present time is to educate the cool to use technology in a way that mediates between knowledge work and a fuller lifework glimpsed in historically other lives and works. Laws of Cool draws on economic and business history, sociology, anthropology, art and literary history, critical and cultural-critical theory, history of information technology, and Internet and new media theory. It balances between historical, formal, and theoretical exposition. It extends the author's practical and theoretical work in cultural history and cultural criticism (e.g., his essays of the 1990's on New Historicism and cultural criticism). While sharing an interest in "information society" and "new media studies" with many recent books, its intent is to ground these topics in a broader, deeper understanding of culture. Preface "We Work Here, But We're Cool"